Can you believe that it is already August! The summer is certainly flying by – this time last month we were waiting for the Supreme Court ruling on the Affordable Care Act (ACA); now it seems that folks are moving into the presidential election waiting game. What impact will the election have on health care? Can we afford to wait to see or should we keep moving forward with implementation of provisions of the ACA that directly impacts health networks and those that networks serve? The majority of your peers I talk with are moving ahead, exploring options with their members on how to best deliver quality healthcare services to the patients within their service area. NCHN will continue to monitor the implementation of the ACA and keep you informed of any potential opportunities for health networks. The NCHN Board of Directors and staff wish Eileen Holloran, Public Health Analyst with the Office of Rural Health Policy, the very best in her upcoming retirement. Eileen has been a strong supporter of health networks and NCHN activities and we will miss her presence at our Leadership Summit and annual Conference. See a final interview with Eileen below. A number of NCHN activities were announced during July and some will be continuing into August. I encourage you to continue your participation and involvement. The new NCHN website was launched in July. If you haven’t visited the site, please take a few minutes to explore the resources available to you as a Network Leader. One of the new components of the site is the network profile section. Seven (7) members completed their profile in time to receive the discount on the 2013 Conference Registration. Over the few weeks, Christy will be following up with members to assist them with questions about the website and to ensure that all NCHN members’ profiles are posted and up to date. Which NCHN Member Network has 58 member organizations, including CAHs, and specializes in group purchasing, insurance products, rural hospitals, staffing, sustanability, and telemedicine? Hint: This network was NCHN's Network of the Year in 2010. NCHN Staff will be offering two orientation sessions. The first session is on Wednesday, August 8 at 3:00 PM ET. (A second session will be repeated on Thursday, September 6 at 1:00 PM ET.) This is an opportunity for NCHN members to review their membership benefits, learn about NCHN programs and offerings and connect with your peers. Details for the orientations were distributed through a Save the Date emailing. If you plan to participate in the August 8th call, please pre-register here. The NCHN 2012 Network Leader Salary & Benefit Survey Report will be distributed later this week to the members that participated in the survey. Thanks to the approximately 65% of the current membership that participated in the survey. If you did not participate in the survey and would like to purchase a copy of the report, please contact me for pricing. 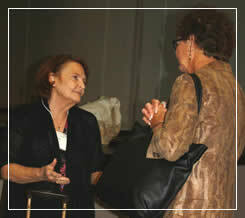 NCHN’s 2012 Leadership Summit – “Do What You do Best and Link to the Rest” is fast approaching and will be held at The Westin Kansas City at Crown Center in Kansas City, Missouri on September 25, 2012. Deadline for room reservations is August 31, but I would encourage you to make the reservations as soon as possible to ensure that you receive the NCHN rate of $125/night. Lodging details are located elsewhere in the eNews! Registration details will be announced later this week through a special email. The RHNR Consulting Task Force has been working for several months on the Health Network Consulting Group initiative and will soon be announcing a call for consultants. NCHN members are eligible to apply to serve as a consultant in the new program. The August Coffee/Tea Chat will be held on Wednesday, August 15 at 12:00 PM ET. This is your time to connect with your peers across the nation and discussion what is on your mind. The Program Development Committee is working on a comprehensive membership survey and plans to release it during August. Please watch your email box for the survey and take a few minutes to complete. Survey results will be utilized for NCHN programming. And the 2013 Conference Planning Committee is working on organizing and planning the 19th Annual NCHN Conference – “All that Jazz” which will be held in New Orleans April 17-19, 2013. The committee will be conducting a short survey about possible pre-conference session(s) and other activities at the 2013 Conference later this month. Please respond to the survey and provide your input to the Conference Planning Committee. In other news this month, we are so happy to welcome a new member! Welcome to Southeast Oklahoma Rural Health Network and Stacie Pace. I think this is our first member from Oklahoma. We look forward to working with Stacie and welcome you to NCHN! Also, Beverlyann Austin renewed as an Associate Member. We are glad to have Beverlyann continuing her relationship with NCHN and look forward to her participation as an Associate Member. Enjoy August, if you are vacationing, we wish you safe travels and a wonderful trip. July 31, 2012 - Many of you know Eileen Holloran through her work with ORHP. As Network Planning Program Coordinator and Project Officer with HRSA's Community Based Division, she has worked with networks for years to oversee planning grants and facilitate network tasks. She has attended numerous NCHN events and has supported NCHN's work in variable ways. Eileen Holloran will be retiring today, after being with the Office of Rural Health Policy since its creation in 1987. We took this opportunity to ask about her thoughts on the future of health networks, their value, and her parting advice for network leaders. Enjoy! NCHN: Over the years, you have worked extensively with health networks. In your work with health networks, how have you seen their work develop and change? Eileen: The organizations making up the networks have become more sophisticated and are finding better ways to communicate, exchange ideas and work together to iron out the overlap and problem issues. NCHN: How do you think the future role of health networks will grow and change? Eileen: I think the networks in rural areas will grow and healthcare providers will become more aware of the need to collaborate to improve the bottom line of their organizations. Also they will recognize how the collaboration works to improve the financial status of their communities. The networks will help keep good, quality healthcare in their communities. I think there will be more dependence on Telemedicine and using urban experts to help in diagnoses and treatment options. NCHN: You have attended a few NCHN events and we appreciate your support. We even spent your 2011 birthday with you in Kansas City! What event/s did you find most memorable or valuable for grantees and why? Eileen: The Network Planning grantees seemed to get the most value of having the experienced network directors present the trials and tribulations they went through while formalizing their networks. They also appreciated the information on how to problem solve with members that weren’t totally on board. And, although I was surprised, all the grantees were impressed by Heman’s presentation on Board Structure, By-Law development and Meeting Management. I was concerned the subject matter was too involved for the newly forming networks. NCHN: What, if any, research or data do you see lacking in the health network realm and what kind of information do you think would be valuable in pushing the role of networks to the next level? Eileen: I am not sure it can be done but I think if you could determine what mix of organizations work best together. That being said, it is obvious that it is the devoted people around the table that are the most important element in success of any endeavor. NCHN: What are your retirement plans? Any plans to travel? Will you continue your involvement with healthcare and with health networks? Eileen: In the beginning I am just going to appreciate not having to get up and out the door early every morning and not having to meet any deadlines. My youngest son is getting married in September so I am not planning anything until after the wedding, but I will travel and find other opportunities to keep learning and my mind active. I know I will go back to work part time, but I am not sure of what type of work I will do. If I am called on to be a reviewer, I would love to continue to work in rural health. NCHN: Finally, if you could sum up all of your years of experience at HRSA in one final bit of advice for health networks, what would that advice be? Eileen: Keep trying. 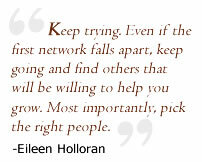 Even if the first network falls apart keep going and find others that will be willing to help you grow. Most importantly, pick the right people. At this time of year, community and board members are getting back from vacation, the summer break is coming to a close, and it is time to move back into more regular meetings and conversations. This will be an opportunity to connect with your colleagues, share questions and suggestions and celebrate the end of summer together! Rebecca and Mary Kay look forward to another lively exchange of opportunities on Wednesday, August 15th at noon (ET). See you then. Please join the Board in welcoming NCHN's newest members: Jeanne Moffat, Network Director of Western Kansas Frontier Information Network, Dawn Wichmann, former director of Lakelands Rural Health Network, and Shannon Calhoun, Executive Director of Southeast Texas Health System (SeTHS). Congratulations to Jon Smith (The Hospital Cooperative, ID), who won a drawing for a 50% registration discount to the 2013 NCHN Conference in New Orleans. Jon Smith was entered into the special drawing for who had participated on the June 7th Quarterly Membership Call and completed their network profile for the new site within 2 weeks of going live. Each of these networks updated their profile and will receive a $10 credit on their 2013 conference registration. All of Paradigm Learning’s training products are engaging, interactive, customizable and results oriented. Executives of member organizations may experience the learning at their location, at no charge, through a two-hour interactive demonstration. This allows members to see for themselves how the program works, what learning takes place and how cost savings can be realized through better informed decision making. CMS subject matter experts provide an overview of proposals for the physician value-based payment modifier. CMS has proposed to phase-in application of the value modifier, starting in 2015 with groups of physicians with 25 or more eligible professionals. The value modifier for these groups would be based on performance during 2013. The presentation describes the options these groups have on how the Value Modifier would be calculated based on whether they participate in the Physician Quality Reporting System (PQRS). For groups of 25 or more that do not participate in the PQRS, CMS is proposing to set their Value Modifier at a 1.0 percent payment reduction. For groups that wish to have their payment adjusted according to their performance on the value modifier, the rule proposes a system whereby groups with higher quality and lower costs would be paid more, and groups with lower quality and higher costs would be paid less. This call also includes a question and answer session. July 25, 2012 (Kaiser Health News) - The Congressional Budget Office projected the court's decision allowing states to opt out of the Medicaid expansion would decrease costs to the federal government, but result in three million fewer Americans gaining coverage. Let’s face it: Running a successful nonprofit is demanding. Our sector is constantly changing and under more scrutiny than ever before. And when you’re mission-focused, it’s not always easy to keep up with the latest leadership trends or legal requirements. Expert answers to your critical management questions. July 25, 2012 (HealthLeaders Media) - Representatives for rural hospitals from states across the nation will head to Washington, D.C. next week to lobby for renewed funding for low-volume adjustment and Medicare-dependent hospitals. The provisions are set to expire at the end of the federal fiscal year on October 1 and the National Rural Health Association says that could jeopardize the solvency of hundreds of hospitals that are often a critical source of healthcare in their rural communities. July 30, 2012 (Eureka Alert) - Mayo Clinic Health System Practice-Based Research Network (PBRN) is sharing in an $11 million government grant to lead the creation of a national learning collaborative among rural health care providers. The effort is part of a national partnership using the Health Care Innovation Award funded by the Affordable Care Act. July 25, 2012 (The Hill) - The Federal Communications Commission (FCC) said on Wednesday that it will spend $115 million over the next three years to expand high-speed Internet service to 400,000 people and businesses that currently lack it. July 26, 2012 (AHANews.com) - Large and urban hospitals were much more likely than small and rural hospitals to receive a Medicare incentive payment for meaningful use of electronic health records in 2011, the first year of the incentive program, according to a report released today by the Government Accountability Office. Just 16% (761) of the estimated 4,855 eligible hospitals received incentive payments in 2011, which totaled $1.3 billion, GAO found. Hospitals paid under the inpatient prospective payment system were more than twice as likely as critical access hospitals to receive an incentive payment. Hospitals in the top third in terms of numbers of beds were 2.4 times more likely than hospitals in the bottom third to have been awarded an incentive payment. About two-thirds of hospitals receiving incentive payments were in urban areas. July 27, 2012 (amednews.com) - The proposed House measure seeks to defund the health system reform law and eliminate a federal research agency, among other reductions. A House spending bill that would fund health, education and labor programs for fiscal year 2013 received a barrage of criticism from physician organizations and others for proposing major cuts to health research and physician education programs while eliminating a federal agency that supports patient safety. July 27, 2012 (The New York Times) - One morning this spring, Claudia Cox, a registered nurse in Jackson, Miss., drove toward the countryside to visit some patients. She often has trouble finding their homes. “The rural people are the worst,” she said. “ ‘Come to the oak tree.’ Well, hell, I’m from the city, I don’t know what no oak tree is. I know magnolia. I know pine trees.” Cox referred to her seven-year-old Ford Freestyle as her “office,” but it had the ambience of an arcade: the ding-ding-ding from her dashboard signaling an unbuckled seat belt, the whir of a phone charger in the cigarette lighter, the phone ringing with the opening of Cheryl Lynn’s disco hit “Got to Be Real.” Cox, a 45-year-old divorced mother of three, juggled phone calls and patients’ charts and cigarettes like some serene octopus, always catching the steering wheel just before the vehicle veered onto the grass. After 20 minutes, she pulled into a pebbly driveway. It was time to find out why Vonda Wells kept going back to the emergency room. July 30, 2012 (HealthLeaders Media) - While the states debate Medicaid expansion under the Patient Protection and Affordable Care Act, hospital executives' confidence in their organization’s ability to care for the uninsured varies. According to the HealthLeaders 2012 Industry Survey, 53% of hospital and health system executives rate their organizations as "neutral" or "weak" in their quality or status of dealing with uncompensated care, while 47% rate their organizations as "very strong" or "strong." July 24, 2012 (Kaiser Health News) - Thirteen states are moving to cut Medicaid by reducing benefits, paying health providers less or tightening eligibility, even as the federal government prepares to expand the insurance program for the poor to as many as 17 million more people. July 30, 2012 (HealthReformGPS.org) - The Centers for Medicare & Medicaid Services (CMS) released frequently asked questions (FAQs) regarding the Medicare Shared Savings Program, a program established by the Affordable Care Act (ACA). Specifically, the guidance addresses Accountable Care Organizations (ACOs). ACOs are formed by providers that have agreed to work together to better coordinate patient care. Information included in the FAQs include general facts regarding ACOs, the ACO participant list form CMS-588 electronic funds transfer, and governing body background. July 24, 2012 (amednews.com) - Researchers are concerned because health system reform will attempt to expand the role of the centers. Family physicians who work in community health centers are not as satisfied with their employers as colleagues working in other types of facilities, said a study in the July/August Journal of the American Board of Family Medicine.